So continuing on with recipes from KISSING FROGS... In the chapter titled "Lessons Learned Over Frittata", Gram and Elliott host a brunch for Elliott's girlfriends. One of the items they serve is a frittata. So it seemed fitting that I make one for my girlfriends to celebrate the completion of the book. 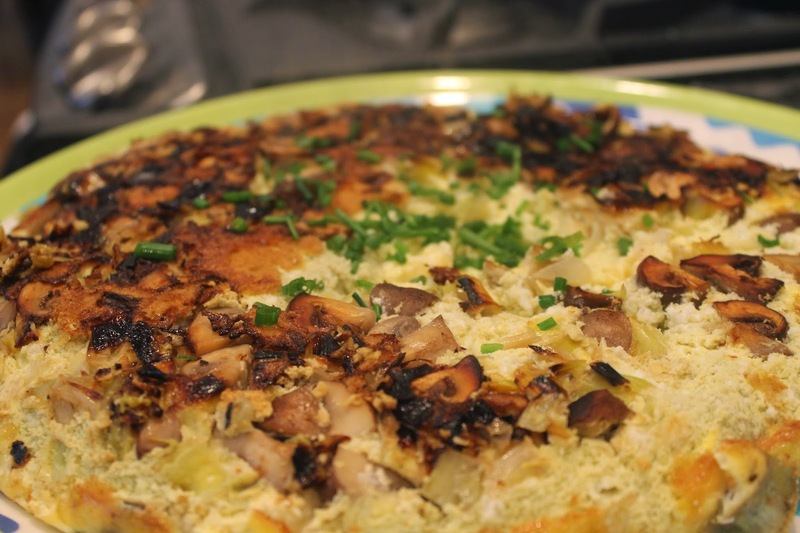 * You can use whatever veggies you like, I just was in the mood for leeks and mushrooms. And honestly, they went together perfectly. So the thing about leeks is that you need to clean them well before using because they grow up through the ground and therefore carry dirt between the layers. So chop them up and throw them in a bowl with water and let them soak for a bit. Then swish them around and drain so all the dirt gets washed out. Toss them in an all metal (because this pan will be going into the oven it can't have any rubber handles etc) pan with two tablespoons of butter. 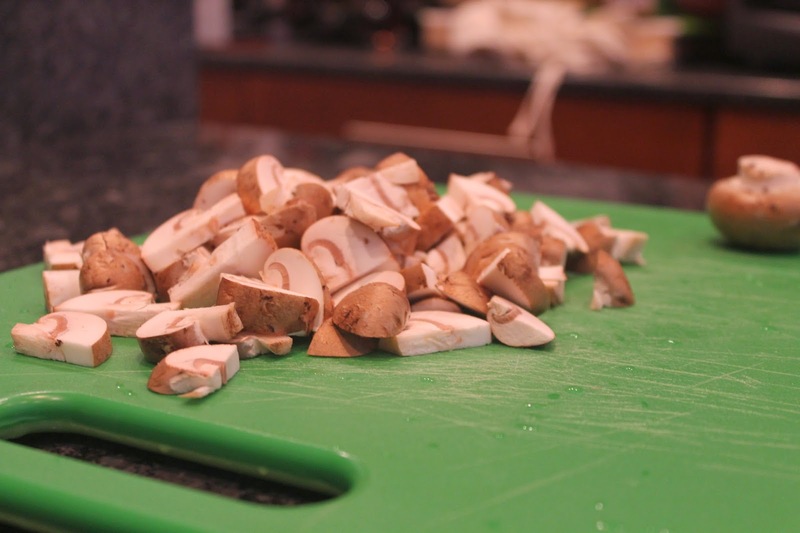 Dice up the mushrooms and add them. Saute (add another tablespoon or two of butter if needed) until they cook down a bit. Whisk the eggs together until well blended and add in the creme fraiche. Stir well. The creme fraiche didn't totally blend into the eggs for me and that was fine because it at least broke down into small clumps and it melts anyway. Meanwhile, cut up the cheese (you don't have to use fontina but it melts really well and I like the flavor so that's what I went with) into small cubes. 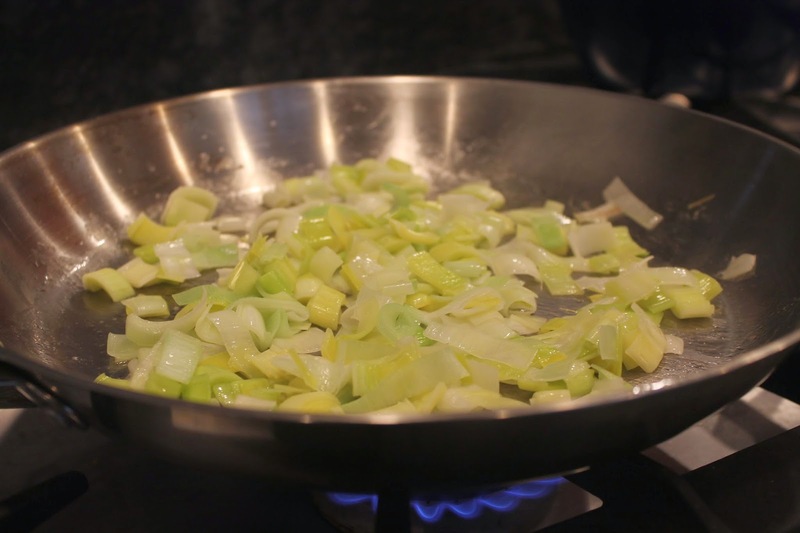 Pour the egg mixture over the sauteed veggies and do not stir. Sprinkle the cheese cubes in and let it sit on low-medium heat until the outer edge of the egg starts to set. Then put into 350 degree oven for about 20 minutes or until the egg has completely firmed up. Always test your concoction with a fork and if it comes out clean from the center then you're done! Remove from the oven and ease a spatula around the outside and under the frittata. Then place a serving plate over the pan and flip it. As you can see below, I should have lowered the heat when I poured the eggs over the veggies because the veggies got a little scorched. Oh well, I learned a lesson for next time. And I just sprinkled some chives over it and everyone forgot it was a little burned. I think between this and the scrambled eggs I won over the hearts of my friends. Well, those of them who had never seen me cook before. And it was so simple! See, it's not difficult to host a brunch! And serving mimosas definitely helps, no? *Images courtesy of Olivia Beane, photog extraordinaire. I absolutely loved this dish! The fontina was divine. I am not even ashamed to say I stole the very last piece. 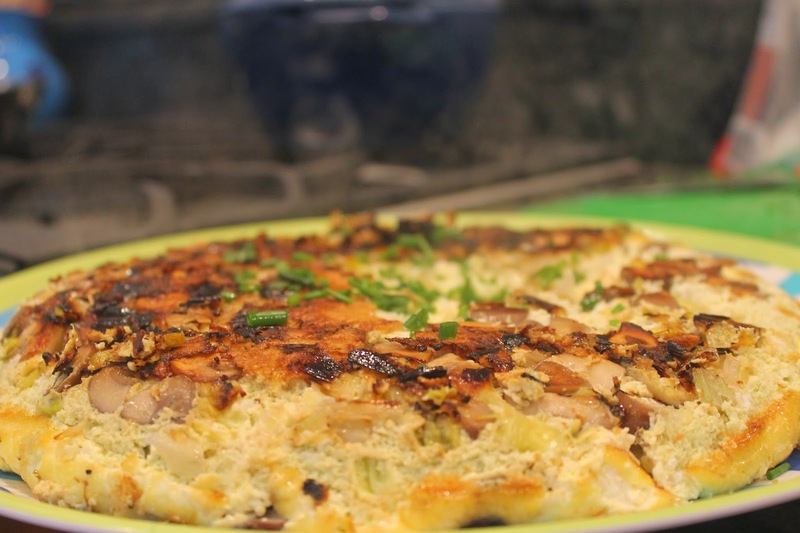 You have made me a leek convert ever since the quiche in Vermont! This was no exception!